More a movie about a powerful person and a powerful event than a powerful movie. Invictus suffers from a larger than life, legendary central character that by definition dominates his surroundings; compounded by a real-life fairy-tale sports story of the caliber that reminds us why sports events can pack so much power. Morgan Freeman portrays Nelson Mandela, upon taking power in 1994 and immediately reaching out to the white South African community in several displays of reconciliation. In addition to retaining white staff members in his office and trusting white security personnel to join his team of personal guards, he controversially insists on maintaining the name and colours of the Springboks national rugby team, despite their strong associations with the minority white population and their lack of popularity among the newly empowered blacks. Mandela develops a strong interest in the sport and the struggling South African squad, and spots the upcoming 1995 Rugby World Cup, to be held in South Africa, as an opportunity for national healing. 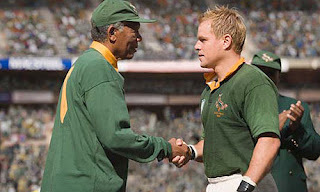 Mandela reaches out to the team's under-pressure captain, Francois Pienaar (Matt Damon), and inspires him and his predominantly white teammates to greatness, as the country comes together in a way that would have otherwise been unimaginable. Clint Eastwood directs with an unusual directness and a lack of of any distinctive style, letting Mandela's personality and the World Cup games take centre stage. Freeman is terrific as Mandela, but it is difficult to distinguish the greatness of the performance from the greatness of the man. Damon as Pienaar is very much a supporting role and never gains traction. He mostly appears lost and overwhelmed by events around him. Ironically, the most interesting narrative thread in the movie defaults to Mandela's personal security guards, where black agents fiercely loyal to the President need to come to terms with accommodating and trusting white agents added by Mandela to the team. Eastwood succeeds in encapsulating the drama of the country within the evolving dynamics between the agents. Invictus delivers the necessary drama and emotional highs, but it all comes across as a workmanlike, relatively uninspired and straightforward re-telling of important historical milestones. Invictus portrays memorable personalities and events, but despite good intentions on both sides of the camera, fails to register as a distinctive movie.